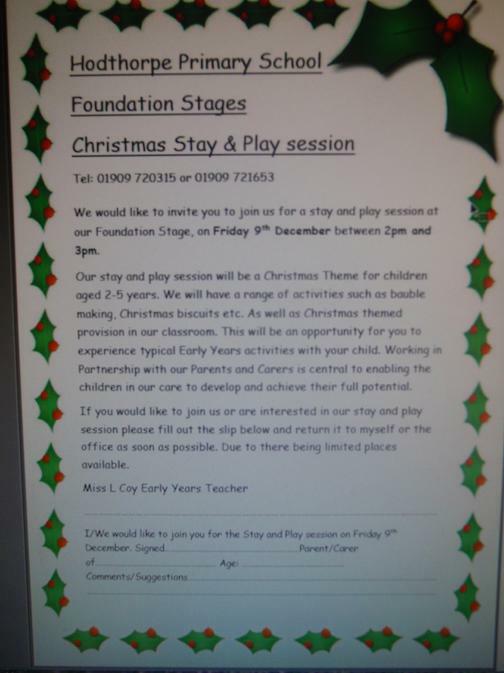 We would like to invite you to join us for a stay and play session at our Foundation Stage, on Friday 9th December between 2pm and 3pm. Our stay and play session will be a Christmas Theme for children aged 2-5 years. We will have a range of activities such as bauble making, Christmas biscuits etc. As well as Christmas themed provision in our classroom. This will be an opportunity for you to experience typical Early Years activities with your child. Working in Partnership with our Parents and Carers is central to enabling the children in our care to develop and achieve their full potential. If you would like to join us or are interested in our stay and play session please fill out the slip below and return it to myself or the office as soon as possible. Due to there being limited places available.